we light the Advent candles. They were perfect for Sunday tea! Prepare this dough 1 day before baking. Makes 3 dozen cookies. Combine butter and sugar in the bowl of your stand mixer. Using the paddle attachment, mix on low speed for about 30 seconds. Increase speed to medium and mix for another 5 to 7 minutes or until the mixture is smooth and pale in color. Add the egg yolk and vanilla extract and mix for about 30 seconds. Scrape down the sides of the bowl and mix for another 30 seconds, making sure egg and vanilla are thoroughly incorporated. Remove bowl from mixer and scrape down the sides of the bowl again. Using a rubber spatula, fold half of the flour into the dough. After the first batch is fully incorporated, fold in the other half and continue folding until all of the flour has been absorbed, 1 to 2 minutes. Pull dough from the bowl and onto a floured surface and divide it in half. Roll each half into a long about 1 1/2 inches thick and place logs on separate pieces of parchment paper. (The parchment paper needs to be at least 4 inches longer than the logs.) Brush the logs with the egg white, then scatter half of the walnuts over each log. Roll the logs back and for until they are completely coated in nuts. Roll each log up within its parchment paper. Finish by twisting the ends of the parchment paper to create a seal. Chill logs in the refrigerator over night. Preheat the oven to 325. Line 2 rimmed baking sheets with parchment paper. Unwrap the logs and using a sharp knife, cut them into 1/2 inch thick coins. Place the cookies on the prepared baking sheets, leaving 1 inch between each cookie. 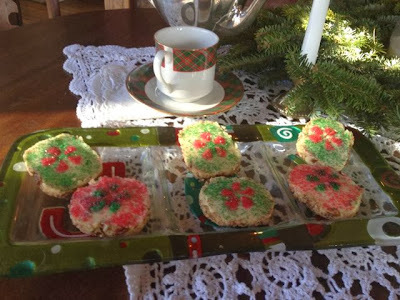 Brush the top of each cookie with a tiny bit of water and sprinkle festive sugar crystals on top. Bake on center rack of oven, 1 sheet at a time for 20 to 25 minutes. To help the cookies bake evenly, rotate the baking sheet every 4 minutes or so. The finished cookies will be golden brown on the edges and pale in the center. Let cookies cool completely on the baking sheet. They can be stored in an airtight container for up to 1 month at room temperature. 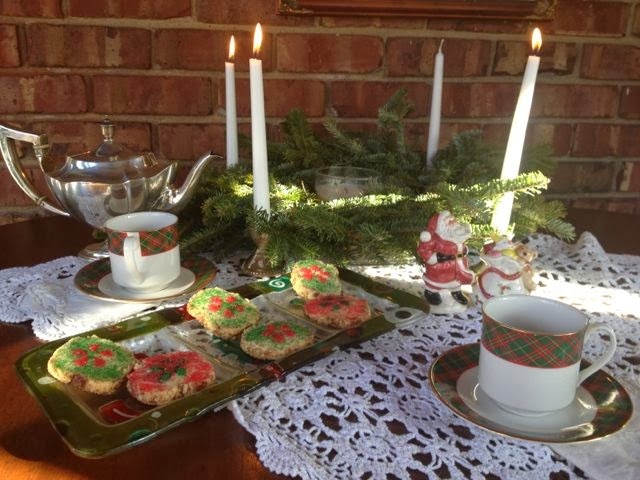 It's Tuesday and I'm joining Sandi at Rose Chintz Cottage for Tea Time Tuesday, Bernideen for Friends Sharing Tea and Marty at A Stroll Thru Life for Inspire Me Tuesday. I like your simple advent wreath with white candles. I have a hard time making the pink and purple look Ok in my house. This is a lovely post, Martha. The advent candles are very pretty and make your tea setting so cozy and meaningful. Thank you for the cookie recipe. Have a joyous week, my friend. I like your Royal Doulton tartan teacups and the cookies you made to have with tea. We're Waiting . . .